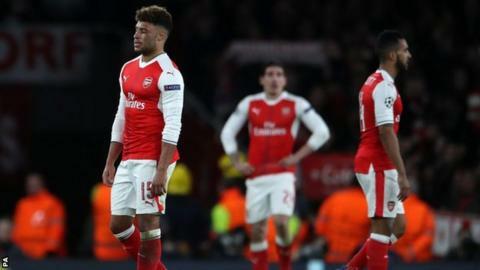 A debated decision in the 53rd minute shattered any hopes of the Gunners becoming the first side in Champions League history to overturn a four-goal deficit, having also lost the first leg in Germany 5-1. They led through Theo Walcott’s stunning 20th-minute goal, before Bayern were awarded a penalty that also resulted in the sending off of defender Laurent Koscielny. The France centre-back was initially shown a yellow card by referee Anastasios Sidiropoulos for his foul on Robert Lewandowski inside the area – but it was upgraded to a red once he decided Koscielny made no attempt to win the ball. The home side then folded as Bayern scored four goals in 17 minutes. Arjen Robben robbed Alexis Sanchez of the ball and beat Ospina, before Douglas Costa made it 3-1 with a stunning solo goal. The 10-2 aggregate defeat is the worst suffered by an English side in the Champions League. It was Arsenal’s biggest home loss since November 1998 (5-0 against Chelsea in the League Cup). Only one Champions League tie has seen a greater margin of victory for a team – Bayern Munich v Sporting Lisbon (12-1, 2009). Only Barcelona (27 against Celtic) have scored more Champions League goals against a single opponent than Bayern have against Arsenal (26). If this was to be Wenger’s final outing in the Champions League with Arsenal then what an embarrassing final act. Aside from the goal, Walcott also went close when Manuel Neuer saved his effort and Olivier Giroud hit the base of the post with a header. Walcott was also denied a penalty after it appeared that Xabi Alonso had fouled him. But Bayern rarely looked stretched and bided their time before punishing an error-strewn second-half display by the home side. Some might debate whether Koscielny deserved a straight red but, under new laws regarding penalties, the referee was right to amend his initial decision to award the defender a yellow. The Gunners’ similarly folded when the Frenchman came off injured in the first leg with the scores 1-1. Arsenal’s initial target of scoring four goals would have still taken the contest into extra time. Any chance of that happening ended when Robben nipped in to take the ball away from the feet of Sanchez, who was inexplicably trying to play the ball on the edge of his own area. Vidal’s double came late and in quick succession. First an error by Shkodran Mustafi was punished with a cheeky dink, before the Chile midfielder tapped in Costa’s pass. The final whistle could not come soon enough for Wenger and his team. While Bayern carried out their own protest against ticket prices by throwing toilet rolls on to the pitch, the main attention was on the ‘Wenger Out’ demonstration before kick-off. A large gathering of fans made it known outside the ground that they did not want the Frenchman in charge of the club. Wenger has yet to decide whether to accept the contract extension or leave the club he has managed since 1996. This week’s saga surrounding Sanchez, the protests and finally now this heavy defeat might have brought the 67-year-old closer to making up his mind. Arturo Vidal, Arjen Robben and Robert Lewandowski were brilliant in attack but Vidal gets the nod – he had the most touches of either side – 100 – with a 90% passing accuracy. Of course, he also scored two goals.